Volunteer US staff and our support of Indonesian nationals exclusively result in excellent amounts of ministry per dollar donated! We are thankful for what God continues to accomplish through CFTIW! We are a faith based Christian organization whose goal is to glorify and honor God by devoting ourselves to the Great Commission. We serve through partnerships with Indonesian Christians in evangelistic, church planting and humanitarian efforts among the remaining unreached and under reached peoples of the country of Indonesia. Our primary contributions to this partnership are prayer, financial support, and encouragement to the workers and sharing the ministry with you. CFTIW has been a member of (click the red ECFA) ECFA since 1988. ECFA (Evangelical Council for Financial Accountability) is comprised of over 2,100 evangelical Christian organizations which qualify for tax-exempt, nonprofit status and receive tax-deductible contributions to support their work. ECFA's steadfast purpose is to articulate, maintain, manifest, and enforce a code of financial accountability, ethics, and reporting which is consistent with enlightened and responsible Christian faith and practice. Christ for the Island World, Inc. (CFTIW) was founded in 1983 by former missionary Rev. M. Kenneth Taylor. We are distinctive in that we work in direct partnership with national believers. This partnership has resulted in the birth of hundreds of new churches throughout much of Indonesia. Thousands have come to faith in Christ and have grown in that faith. This represents the fruit of our commitment to Christ’s final command to his disciples found in Matt. 28:18-20 and Mark 16:15. We work cooperatively in many ways, but our focus is on evangelism, church-planting, discipleship and clean water projects (Living Water Projects) in Indonesia. Indonesia is a third-world country where a few US Dollars go a long way. By ministering through Indonesian nationals, we are able to use the Lord’s money far more economically! Indonesia ranks fourth in population behind China, India, and the United States. It stretches 3,000 miles from West to East, about the same as the United States. It is home to 186 million Muslims, far more than any other country in the world. 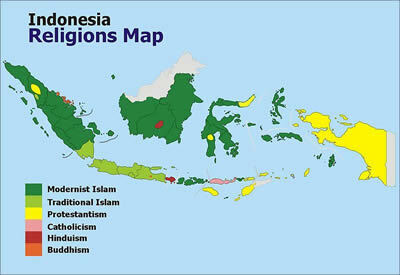 Indonesia is currently 80% Muslim and 12% Protestant. Several factors have allowed rapid expansion of the Gospel in the past. One is the law that the Indonesian language would be taught in all the schools. This allowed missionaries to learn just one language and be understood by practically everyone! Another was a law that required everyone to have one of the six officially recognized religions (Islam, Hinduism, Buddhism, Confucianism, Catholicism, and Protestantism). This meant that the millions of animists had to choose to identify with one of these six religions, leading many to become true believers as the Gospel was shared by Western missionaries and by Indonesian Christians. © 2019 Christ for the Island World. All Rights Reserved.